Shelby had her surprise hospital adventure almost a year ago, and we're still dealing with bills and paperwork stemming from the experience. The billing office of the cardiologist who treated Shelby is resolutely convinced that we owe them $339.00. Our insurance says that not only has the cardiologist been paid, they've been overpaid, and that we don't owe them a cent. The $339 figure comes out of a mistake on the billing office's part — the cardiologist is a member of our insurer's network, but the billing office billed it as an out-of-network claim, which dramatically upped our initial 'patient responsibility'. Our insurer has supposedly transmitted voluminous details about their claim revisions to the billing office. They say they've sent multiple dunning letters requesting their money back. Two insurance reps that I spoke with took down the billing office's phone number and our account info, promising to call and intervene on our behalf. Now our case has grown too complex for the first-line telephone support people to deal with; it's been whisked away for review at a higher level. On the other side, to hear them tell it, the billing office is poor, unloved and misunderstood. They claim that they haven't heard anything from our insurer for months and months. Nobody's called. They've never received anything to contradict or countermand our initial $339 worth of 'responsibility'. (They claim that they spoke with someone at our insurer who said that yes, we did owe $339, but mysteriously, that person has no name; other supporting details were likewise hazy.) Why, they didn't even cause the initial billing mixup that's put us into months of he-said, she-said hell — must've been something they did wrong over at the insurance company! I don't know what we're going to do, but we're going to have to Do Something pretty soon. Our $339 charge has been slowly marching across the bottom of the monthly bills that the cardiologist's been sending — at first, 'Current', then '30-60 Days', '60-90 Days', '90-120 Days', and now 'Over 120 Days'. I don't want them to throw this into collection and possibly mess up our credit, but $339 is a bit much just to make them go away. Maybe this is just a business maneuver on the cardiologist's part; the last couple of times that I sparred on the telephone with the billing office's representative — imperturbable, unhelpful, and unshakably convinced of her complete and total infallibility — I've come away feeling like I need a cardiologist. We don't watch TV around here (too cheap to pay for cable, rabbit ears don't quite do it, and the stuff rots yer brain anyways), but that doesn't mean that I can't be dismayed at Daystar Television Network's attempts to purchase KOCE-TV. Daystar is a Christian broadcast network out of Texas; KOCE is Orange County's local public television station. Back in 2004, the Coast Community College District, which had been running KOCE, decided that it shouldn't be in the TV business anymore and sold KOCE's studios and broadcast license to the KOCE Foundation, a non-profit set up to run the station. During the sale, the foundation bid $32 million for KOCE, with $8 million up front and the rest to be paid in installments; Daystar bid $25 million, up-front and in cash. (In a move that confuses me but was apparently intended to underscore their seriousness, Daystar 'upped' their bid to $40 million after the bidding process closed.) After the sale, Daystar took the foundation and the community college district to court, claiming that the district was obligated by law to sell the station to the party with the highest cash bid. After losing that case, Daystar went back to court, alleging religious discrimination. Today, an appeals court ruled that the sale of KOCE was flawed, and that the foundation had to give KOCE's license back to the community college district. What happens next is unclear. Daystar obviously wants to turn KOCE into nothing but a repeater for programming piped from their headquarters in Dallas; if they succeed, the only local employee left will be the guy in charge of making sure the satellite uplink is turned on. It irks me that KOCE, Orange County's only public TV station and the only station with OC-focused news and current affairs programs (there was an experiment with an "Orange County NewsChannel" on cable TV in the 90s, but that folded years ago) may go dark as the result of a bunch of so-called 'Christians' on a vindictive, petty-minded mission to acquire the station at any cost. It irks me that people who have $40 million in cash to wave around have the chutzpah to claim religious discrimination! If you think likewise, you might want to let Daystar know how you feel. Also changing the face of the casino floor since our last trip to Vegas is the advent of cheap LCDs; they're everywhere! Now it's easy and economical for even the most humble of penny slots to be as flashy as it wants to be. Jonathan Root, who played the lead character in the performance of Avenue Q that we watched on Monday night, has a blog. He's not talking about much that's Q-related at present (probably because the production is being prematurely closed at the end of the month — if I were him, I'd just be bitter), but it's interesting to go back in his archives and look behind the scenes. The Prius: Performed admirably — took about a half-tank of gas to make the trip between Anaheim and Vegas, averaging about 46 mpg. We discovered some weak points: it doesn't particularly like long uphill stretches; it'll run smoothly until the battery is depleted to a certain point, whereupon you'll lose any battery assist and turn into a 76-hp four-cylinder mid-sized car, fighting its way uphill (while trying to charge the battery at the same time). But it all averages out on the downhill side, as you acheive insane fuel economy while topping off the battery at the same time. So unless your route is the proverbial uphill-both-ways hardscrabble path, things work out okay. Our other embarassment came on the Strip, when we were stuck in gridlock while trying to drive from the Mandalay Bay to the Wynn. It was a balmy early-evening 110 degrees outside, so we had the windows rolled up and the air conditioner on. Again, the Prius valiantly tried to keep things going solely on battery power for as long as it could, but without any motion to charge the battery, eventually it had to kick in the gas engine to keep the battery at an acceptable level. So we ended up with ten minutes of sad zero-mpg not-driving on our fuel-economy display. Thankfully, we don't commute uphill through gridlock in 100+ degree weather every day. Otherwise, I guess that we'd be pretty upset. We got a box of wine via FedEx Ground yesterday. 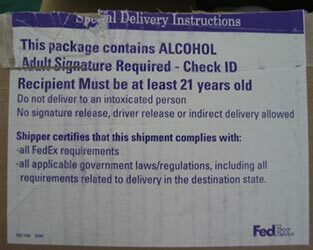 Something about FedEx's ginormous "This package contains ALCOHOL" label always amuses me -- maybe it's the "Do not deliver to an intoxicated person" admonition, which always brings a mental picture of a shaggy-looking guy in a bathrobe and flip-flops, nursing his last bottle with shaking hands as he stares out the front window waiting for the box of wine that he ordered three weeks before. Maybe it's the fact that UPS just adds an additional "ADULT SIGNATURE REQUIRED" line, printed in micro-type, to their normal shipping label. So why does FedEx insist on the giant label? Is it because they're a bunch of puritans, or because of that one driver who dropped off that case of 1921 d'Yquem on the front step of a house full of teenagers having a drunken pool party? In the same primary election that's got Tom Umberg walking our neighborhood, there's a guy named Tan Nguyen who's running in the Republican primary for US Congress. If Nguyen wins the primary, he'll be going head-to-head with the Democratic incumbent, Loretta Sanchez (who first came to Congress in 1996 after beating out only-in-Orange-County fixture 'B-1' Bob Dornan). Nguyen appears to be something of an opportunist, one of those guys who really really wants to be in office no matter what: in 2004, he ran for Congress in an adjacent district as a Democrat. Now it looks like he's playing the numbers, hoping that the Republican bloc plus the Asian-American vote will be enough to overcome the Democratic+Hispanic voters who've been keeping Sanchez in Congress. While everybody else seems to be soft-pedalling the primary so far, Nguyen is going all out, papering our neighborhood with junk. No vacant lot or expanse of fence is safe from his giant electric-green signs that feature a headshot and a campaign slogan: "Not afraid to tell it like it is." So what is 'it', exactly? What are the brave words that Tan Nguyen speaks, but all other candidates fear to say? It's difficult to tell, since every time I've tried to visit his Web site, tanforcongress.com, it's been broken. Grandpa Simpson: "I used to be 'with it', but then they changed what 'it' was. Now what I'm with isn't 'it', and what's 'it' seems weird and scary to me!"